We like to keep our kids active all summer with lots of time to run and play outside. Of course, we’re always stocked up with healthful, easy-to-grab and quick-to-eat treats. My kids often reach for frozen yogurt when it’s warm outside, so these Frozen Fruit and Yogurt Discs are great to keep on hand. 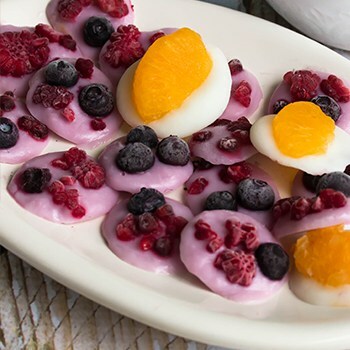 They’re made with creamy whole milk yogurt topped with your favorite chopped fruits. Often, we freeze tubes of yogurt, or we make flavorful popsicles like these Green Smoothie Parfait Popsicles or these Milk and Cereal Breakfast Popsicles. When our kids were toddlers, I used to make and freeze tiny bite-sized dots of yogurt for them to enjoy. These days, we make them a bit bigger and pack them full with diced fruit like berries, mandarin oranges, and kiwi. Clearly, we LOVE our delicious, dairy-filled foods! 1/4 cup chopped strawberries, blueberries, oranges, kiwi, etc. 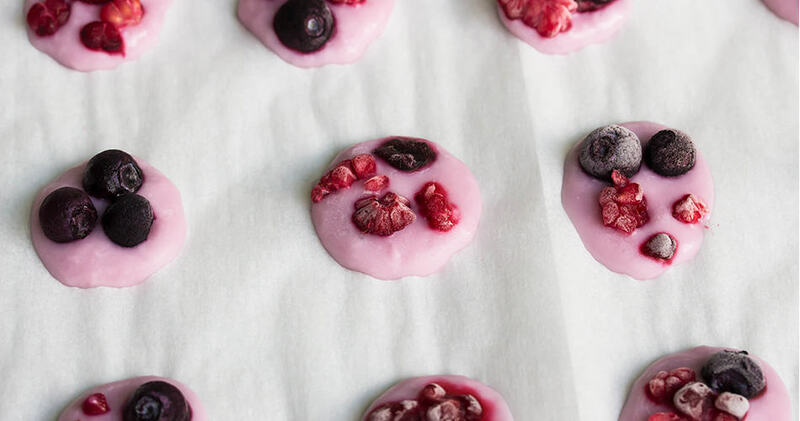 Drop bite-sized dollops of yogurt onto a baking sheet lined with waxed paper or parchment paper. Top with small pieces of fruit.